THE future looks bright for Hampstead after the youngest team within the football club brought the curtain down on a triumphant campaign in the Camden and Islington Youth League. The Under-8s side ended their debut season at Market Road with an outstanding record of 14 wins in 16 games. 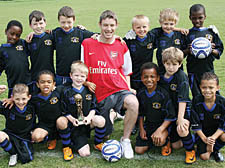 Although the Under-8s Division is deemed non-competitive because of how young the players are, Hampstead would have been crowned champions if officials had kept an updated league table. As a reward for their efforts, the youngsters were still treated to a trophy presentation at the club’s end of season awards ceremony. There was also a special surprise for manager Micky Dowsett, who was given an Arsenal shirt signed by all of his players.